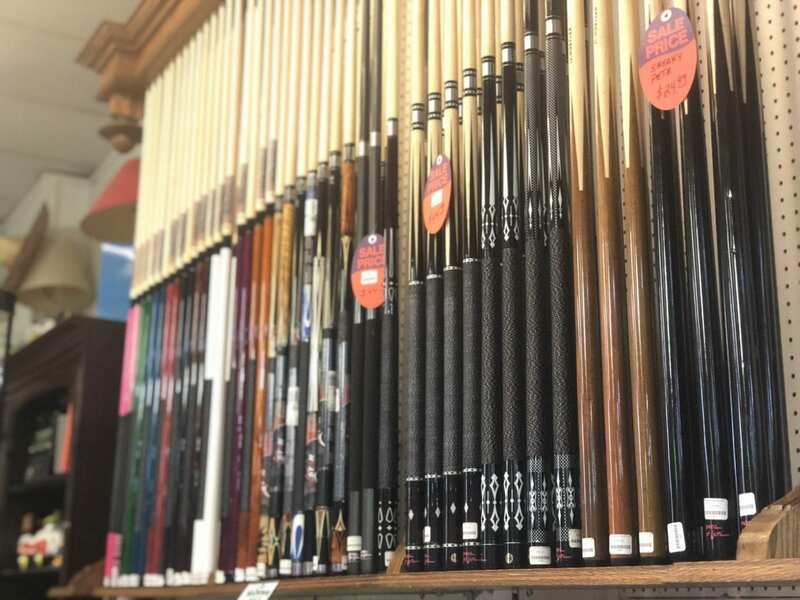 If you’re an experienced player, selecting a cue means more than just grabbing what is available on the stand. Each cue is different and will provide you with different benefits during your game. Picking the best cue for yourself does not have to be expensive. If you are just beginning to play pool, don’t worry about getting the best cue on the market. At Games For Fun, we have a wide variety of styles that can accommodate every level of player. You can check out our entire selection online and at our showroom in San Bernardino. We have cues as low as $12.99. The length of cues varies slightly, depending on the needs of the player. On average, most cues will be in between 57 to 59 inches. A standard one-piece cue will be at 57 inches, while a two-piece cue will be 58 inches. One-piece cues are great for keeping in the game room. If you travel with your cue, having a two-piece is much more convenient for storage. If you are below average height or need a cue that is suitable for children, the best option is either 36 inches or 48 inches. The weight of your cue corresponds with the length of your cue. If you are smaller or a junior player, a lighter cue will be much easier to maneuver. Pool cues normally weigh in between 17 ounces to 21 ounces. If you are unfamiliar with the correct weight for you, it is important to try out your cue before purchasing. If the cue is too heavy, you can risk lifting the tip of the cue, which will skew your aim. Nobody wants to scratch like that! Having the proper tip on your cue can transform your pool game dramatically. We carry different sizes and materials to fit every type of cue. Be sure to get the correct tip for your cue, as there are a variety of installment types. Most of our cue tips come in four separate hardness levels: super soft, soft, medium, and hard. Hard cue tips will last longer than softer styles, but they create a more difficult ball spin. Deciding which type of cue tip to get will depend on how often you replace your tip. When the tip begins to wear, it will affect your game play. Whether you just picked up billiards as a hobby or you are an experienced veteran, we have hundreds of cues for every level of player. Did you know? Games For Fun is one of the West Coast’s top distributor for McDermott pool cues. McDermott cues are proudly made in the U.S.A. and are covered by a lifetime warranty. Our staff is happy to take you around our showroom in San Bernardino and show you all of the models we have available. You can visit us right off of the 215 freeway on exit 43 for West 2nd Street. Not in the area? Give us a call at (909) 885-3604, and we will answer any questions you may have.